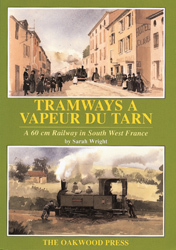 The Tramways � Vapeur du Tarn is a 60 cm narrow gauge railway which can be found just 20 miles from Toulouse in south-west France. The original network was the second most extensive 60 cm system in France until closure in 1937, however, part of the route has been revived as a tourist railway. The line is well-known in France with its station in St Lieux (the trains set off through a village street) and its route lying over a spectacular viaduct overlooked by the precipitous village of Giroussens. This is followed by woodland then water meadows until the terminus is reached. The book contains many photographs, as well as maps, station layouts and sufficient drawings for the modeller to be able to recreate most of the locomotives and rolling stock of the railway. A5 format, 208 pages, more than 150 illustrations.